Bollywood Actress Raveena Tandon wore a blue colored Payal Khandwala Signature Tunic with a squared hemline, which just looked like a high low dress with elevated frm the front with perfect curves. 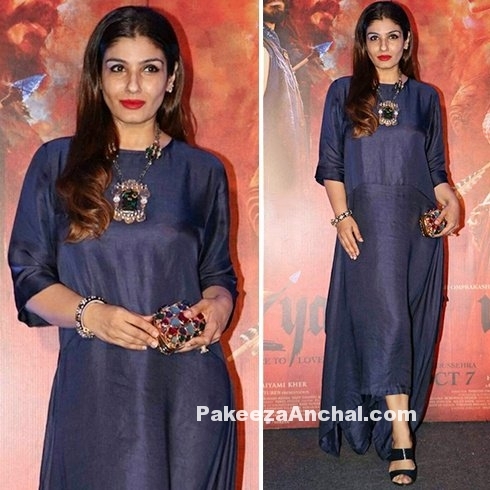 Raveena Tandon was styled in mid-parted hairs, red lipstick and blue sandals along with a stylish neckpiece. Kareena Kapoor was happy all the way with the success of her movie Ki & Ka. Bebo was the center of attraction wearing a Grey one Shouldered Tunic designed by Payal Khandwala along with her straight pants in white color. Bebo wore a Stone studded Necklace with grey Clutch and high heel sandals for the event. Aishwarya scored 10 on 10 in with her style when she was spotted in an event held in Mumbai during SarbJit’s promotion wearing a Payal Khandwala Dress from Spring Summer 2016 Collection. Aishwarya Rai chose to wear Silver Jewellery from Amrapali Jewels and a cuff bracelets with pointed shoes by Dior to complement her outfit. Richa Chadha in a new look wearing a one shoulder outfit with ethnic vibes designed by Payal Khandwala. The One Shoulder was just like a wrap in green color with purple border to it and white Palazzo pants with black high heels. Shilpa Shetty was wearing a one shoulder pink top along with a contrast colored eye catchy Orange Silk Skirt designed by Payal Khandwala in Bangalore recently to be on the judging panel of a dance show. She paired it with a pink lips and soft hair curls.